The headline is tied to a commentary piece that also appeared on Syracuse.com on August 29th. The author, Jacob Alan Roberts, is an artist, entrepreneur and community developer, according to the bio published in the paper. Although "community grid' advocates contend that a complete tear down and replacement boulevard would cost almost half a billion less, would avoid the demolition of 20 downtown buildings, require fewer years for construction and would free up land for development, I don't share their vision. I say, let's go further and make a bold statement about our future. 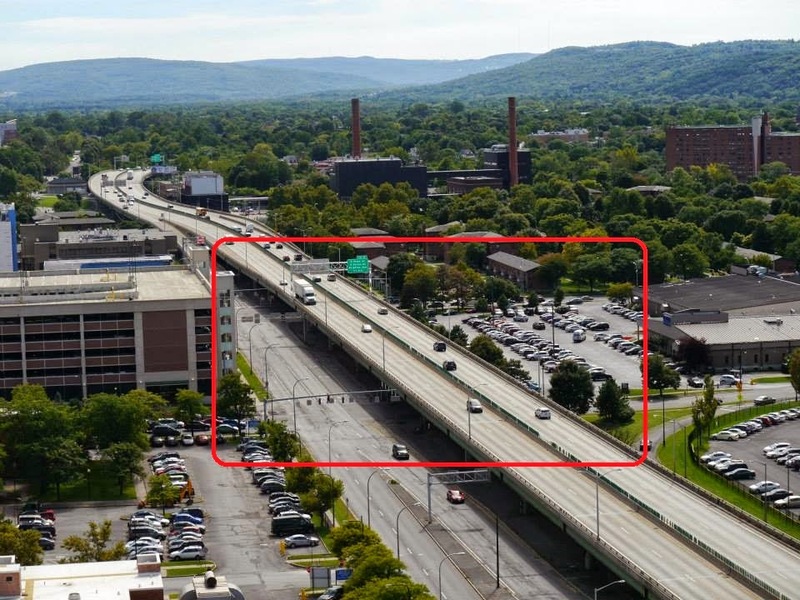 What if, instead of demolition, we "recycle" that epic eyesore and convert the elevated infrastructure into a raised, linear park with placed to enjoy the outdoors, play, stroll and lounge while viewing Syracuse's historic and fast-developing skyline? Roberts goes on to talk about how his Skyway could function: jogging paths, outdoor art, an environmental marvel with gardens fed by porous pavement, a treed canopy, and such. His ideas are similar to what's currently being done with New York City's Skyline and other projects, including 18 in the US. I understand my proposal for the "Syracuse Skyway or the "Peacemakers Pathway" is a long shot but some long shots pay off big. 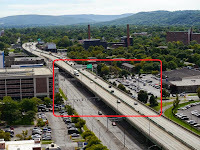 Hopefully, in the name of a cool, clean and green future, full of innovation, sustainability and outside-the-box thinking, local I-81 stakeholders will pause for deeper consideration. I love this idea! In fact, I proposed the same thing -- back in June 2014 -- except I called my version Viaduct Park. The park could be located somewhere in the general neighborhood of the red box on the picture shown here. The actual boundaries would be determined by where the viaduct was cut off from traffic on the north and south. Add access points at each end and in the middle, using a combination of ramps, stairs, and pedestrian bridges. At least one access on each side would need to be an elevator. Engage the folks from local colleges, most importantly SUNY-ESF and Cornell, because we'll need landscape designers, maybe even a contest, to come up with the best plan which would ideally include a combination of covered and uncovered places, seating areas, a measured walking path, and native landscaping. Maybe a portion could be used as an educational space where master gardeners help community gardeners? Engage the Save the Rain people to make sure we are incorporating re-use of rainwater and snow runoff, similar to how we're doing it at the War Memorial. Engage local engineering firms to assist with the project, particularly those with green building and alternative energy experience, so we can figure out two things: (1) how to make it brighter underneath the park, one of the big concerns with the existing viaduct (and in part why the new viaduct options include making it so much higher) and how to use solar energy to light the park itself. The primary mode of transportation in the Park would be feet, but if necessary incorporate a couple of spots so that folks on bikes won't be forced across the busy Boulevard, but could go up and over it to get to the other side. Seriously -- if we're going to spend over a billion dollars, let's get something out of it that will bring people to Syracuse, rather than having them just fly on by. Why don't we think about engaging people rather than only on getting them from A to B as fast as possible? And, I wondered, what could our new Viaduct Park become? Yeah, I like this idea -- I like it a lot.